An extension of the diagnostic EP Study is the catheter ablation. In a similar way, catheters are placed intravenously and advanced to several positions within the right heart. These catheters can be used, a s with the EP Study, to record from and stimulate the heart. These catheters can be manipulated throughout the heart in an attempt to identify the precise location from which an arrhythmia originates. Since most arrhythmias require a specific and usually small area of the heart in order to begin or continue, localization of these key, but ablating these vulnerable sites, could lead to elimination of the arrhythmia. If these sites are identified, a catheter is moved to this area of the heart. The tip of a specially designed catheter placed in this position can be used to deliver high frequency, or radiofrequency, energy. This energy will heat up the adjacent tissue to the point of coagulation. The amount of tissue heated, however, is quite small. But if it includes the critical area for arrhythmia formation, this tissue can be permanently made nonfunctional and thus incapable of causing an arrhythmia. The anticipated results of the procedure depend somewhat on the nature of the arrhythmia targeted. For the most common arrhythmias, the procedural success rate by experienced operators is in the range of 90-99%. The risks of the procedure are generally small and often only related to intravenous puncture. Serious cardiac complications are uncommon, but can occur. Before your procedure, we will order an electrocardiogram (ECG) and some blood tests, and we will discuss the RF ablation procedure-explaining its purpose, benefits, and potential risks. We will also go over all medications you are taking, and give you any special instructions concerning them. You’ll also be asked to sign a consent form. This is a good time to ask any questions or voice any concerns you may have. If you”ll be coming into the hospital as an outpatient, you’ll be told where and when to report. You’ll be instructed not to eat or drink anything after midnight the evening just before your procedure. You may, however, take sips of water to swallow pills. You should plan to be at the hospital for most of the day (typically, the procedure takes three or more hours and then recovery can be around three hours). You should arrange for someone to drive you home. You’ll then be moved by stretcher or wheelchair to an electrophysiology (EP) laboratory where you’ll be positioned on a special table and covered with sterile drapes. The entire EP staff, who have been trained specifically in the electrical activity of your heart, will be wearing surgical hats and masks to assure that everything remains sterile throughout your procedure. The catheters used for the ablation will be inserted through the veins in your groin. Usually, two to three catheters are inserted into a vein on the right side of the groin. You won’t feel the catheters moving through the blood vessels and into your heart. These catheters will be positioned in your heart using a special type of x-ray called fluoroscopy (live-action picture). 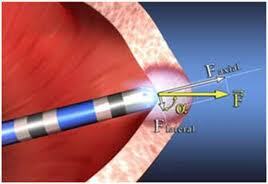 Controlled impulses will then be delivered through one of the catheters to induce the suspected abnormal heart rhythm. Your electrophysiologist may decide to use sophisticated computer aided 3 Dimensional mapping system and intracardiac echocardiography to identify the arrhythmia circuit and its source. Once the arrhythmia source is identified and located, the RF energy will be delivered for 30 to 90 seconds at a time through one of the catheters to the abnormal pathway. Sometimes it”s necessary to deliver the energy several times to ablate (eliminate) the pathway. When it appears the abnormal pathway has been ablated, the physician will test to be certain your abnormal heart rhythm can no longer be triggered. After the ablation is completed and the catheters are removed, pressure will be applied to the insertion site to prevent bleeding. If you have received blood thinners during your procedure the nurse will wait till your blood is thickened up to remove the plastic tubes from your groin. You’ll then be taken back to your room or to a recovery area and required to stay in bed for three hours, keeping your head on a pillow and your legs straight. During this time, you’ll be given something to eat and drink, and your heart will be monitored. If you feel any warmth, pain, or swelling at the catheter insertion site, be sure to tell your nurse immediately. Depending upon the type of arrhythmia and location of the ablation, you may stay in the hospital overnight for observation. Before leaving the hospital, you’ll be given detailed instructions about caring for the puncture sites. Your physician will also explain follow-up plans and discuss what signs & symptoms should be reported. Your RF ablation should restore your heartbeat to the regular rhythms necessary to pump oxygen-rich blood throughout your body. However, you also play an important role in staying healthy. Be sure to keep all appointments for exams and follow-up tests. Follow your instructions, don’t hesitate to talk about your concerns, and immediately report any new symptoms.